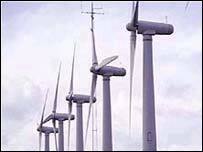 Six new wind turbines could soon be erected in south Lincolnshire. South Holland District Council is to consider an application from Wind Prospect Developments Ltd on Wednesday. There have been many local objections to the plan for the 100 metre structures at Gedney Marsh near Holbeach. Planning officers have recommended permission is given for the turbines at Red House Farm. This is despite 86 letters expressing concern about issues from noise disturbance to the effect on the landscape. Officers say the turbines would be a good source of renewable energy and would not have an unacceptable impact on people living nearby. . It is estimated they would generate enough power for more than 6,000 homes.